Frederick W. Taylor (American 1856-1915), founder of "scientific management"
Then worked for Bell Labs; A Mathematical Theory of Communication (1948), published post-war, introduces formal conceptions of "noise" and "information entropy"
The machine eventually built on Turing's ideas at Bletchley Park, the Colossus, now considered "the first programmable digital electronic computer" (Wikipedia), "an engineering marvel, ... [it] contained 1500 vacuum tubes. 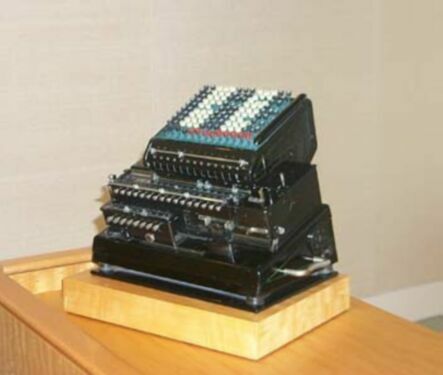 The world's first electronic automatic calculation device had been born. 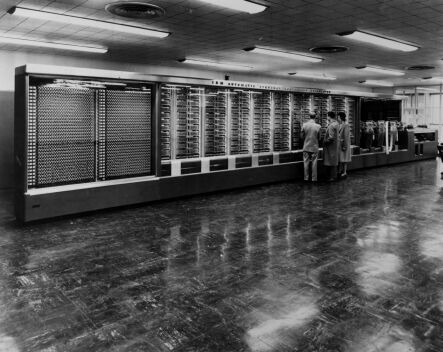 Not surprisingly, the computations it carried out were logical rather than arithmetic in nature. Intercepted German communications in the form of punched paper tape were fed to the machine by an extremely fast tape reader: as the tape moved through the reader, beams of light passing through holes in the paper were intercepted by photoelectric cells which passed the signal on to the Colossus" (Davis, Engines of Logic, Ch 7, p. 175). 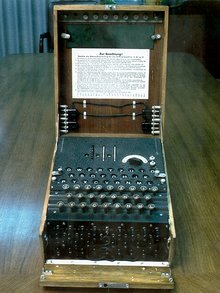 "A 3-rotor Enigma machine showing, from bottom to top, the plugboard, the keyboard, the lamps and the finger-wheels of the rotors emerging from the inner lid. 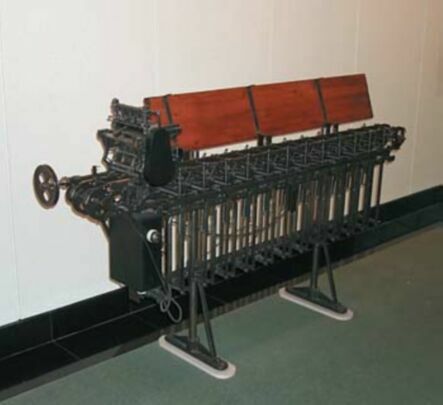 The plugboard indicates that this machine is a German military Enigma." Breaks processes down into "algorithms," each step corresponding to a "state." The transistor was invented in 1947 at Bell Labs by John Bardeen, Walter Houser Brattain, and William Bradford Shockley, who were awarded the Nobel Prize in physics for the discovery in 1956. The transistor is an entirely electronic switch. It has no moving parts, and is made from a material called a semiconductor. A semiconductor—the most widely-used substance is silicon—conducts electricity under some conditions, and does not conduct under other conditions. Made of semiconducting material, a transistor is configured with three terminals. The terminals are set so as to respond in two different ways, depending on whether the material conducts or not. Transistors are used for the same purposes for which vacuum tubes were used: to amplify electronic circuits (as in music amplification), and to create switches. Switches made of transistors function like mechanical or electric switches—turning on and off—but this is done entirely with electronics and no parts move. Transistors are therefore referred to as "solid-state." 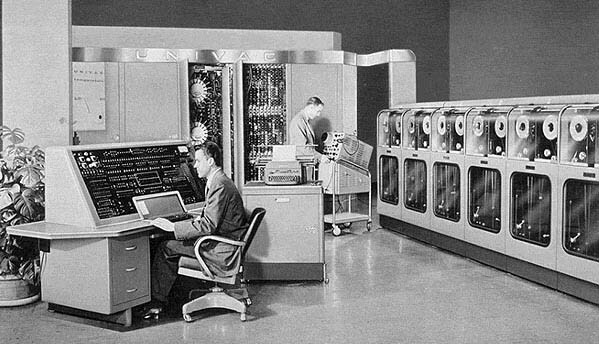 With UNIVAC, we have fully arrived at the digital computer. What distinguishes the digital from the analog? From Wikipedia entry for digital: "A digital system is one that uses discrete values rather than a continuous spectrum of values: compare analog." From Wikipedia entry for analog: "An analog (American spelling) or analogue (English spelling) signal is any continuously variable signal. It differs from a digital signal in that small fluctuations in the signal are meaningful. Analog is usually thought of in an electrical context, however mechanical, pneumatic, hydraulic and other systems may also use analog signals. The word 'analog' implies an analogy between cause and effect, voltage in and voltage out, current in and current out, sound in and frequency out. An analog signal uses some property of the medium to convey the signal's information"
Example: recorded music. A vinyl record (LP) is analog; the grooves which the needle reads correspond in a continuous, physical way to the frequencies of the music. An MP3 file of a song, on the other hand, is ultimately converted into the computer's binary code of 1s and 0s. This code has no physical analogy whatsoever with the music, and its values are discrete (they are all either 1 or 0). The digital is the more restrictive label. One way to understand the distinction is: the digital is anything which is represented by discrete values (e.g., integers). The analog is anything that is not digital. Think of other examples of media and technology. Are they digital or analog? Why? Are there mixed examples? What kinds of connections can you draw between "rational processes" like Taylorism and Fordism and the rise of computing? 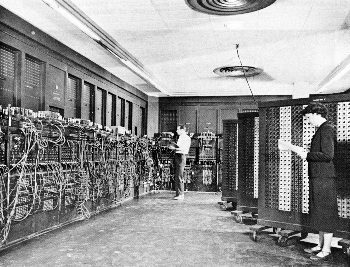 Does IBM's potential complicity in historical atrocities say anything fundamental about the business or technical practices in which they engage? Why or why not? 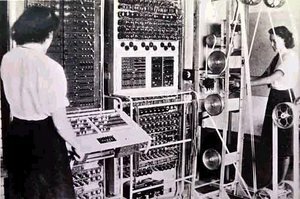 What is at stake in the controversies (as recounted here and more fully in the textbook) about who built the first computer?